Bolo Lêvedo is a Portuguese sweet muffin typical of the Azores Islands. It is widely popular throughout the Azores as well as New England. The most famous are baked in Furnas, in the island of S. Miguel. 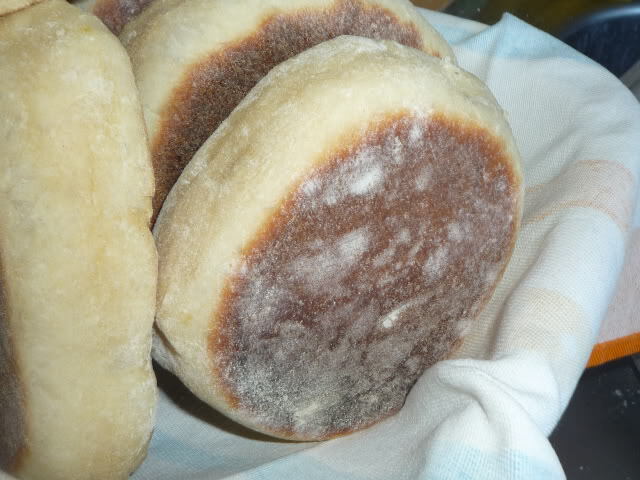 Bolos Lêvedos are saucer size thin muffins, golden brown on either side and dusted with some baking flour. It has a delicious lightly sweet taste but the smell is unforgettable. Freshly cooked and toasted with butter, there might be no better pair for the morning coffee. If you want all the works, toast with Azorean grass fed butter and serve with freshly made Porto Formoso green tea. It’s to die for! 3) Transfer the yeast mixture to a large bowl, and stir in the sugar, eggs, salt, flour, and milk until the dough becomes a smooth and even consistency. 8) Place the cakes in a large ungreased pan, and cook on low heat. I came across this blog via Facebook. Your recipes are easy to follow and my Bolos turned out amazing. So much so my husband asked me to make more! I have followed the Biscoitos recipe and although they taste just like a Biscoito they look more like little cakes and not smooth like we are accustomed to. I am thinking that I may have needed more butter to smoothen out the dough. Love your authentic recipes….keep them coming! Muffins, I hope somewhere on the Internet ? They are a bit difficult to find online, but this Portuguese food shop seems like a good option. Go to http://www.3mealmuffin.com for the original Portuguese Muffin. These are delicious!They can be easily found in the bread sections of major grocery stores in southeastern Massachusetts and Rhode Island (stop & shop, Shaws, Market basket),three-four dollars or so for a pkg of 4 or 6. Don’t pay too much online! You can order from me. Email me. Can’t wait to try this recipe, it looks easy enough, except what is “cook at low heat” and for how long? Do you mean a frying pan, then turn it up for the last step? Low heat is one of the lowest heat settings you have on your stove top, but not the lowest, basically between the middle option and the lowest. The length of time needed to cook it can vary, but the indicator of when it is done and ready to flip, is when the bottom is dark golden brown, at which point you must flip and repeat the process, and then they are done and ready to serve. You maintain the same heat throughout the entire process. So they are not cook in the oven, but on the stove? Indeed! I am sure there are also ways to cook them in the oven as well. Will try it out and report back the results!